Lets dispel a number of myths about learning to scuba dive once and for all. 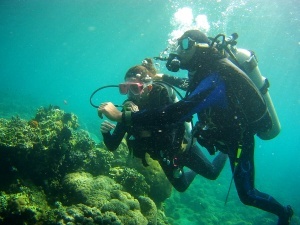 There is the general belief that scuba diving should only be done by highly skilled professionals. Scuba diving is naturally a physical activity and requires you to move about, but this shouldn’t be a deterrent to learning to dive. 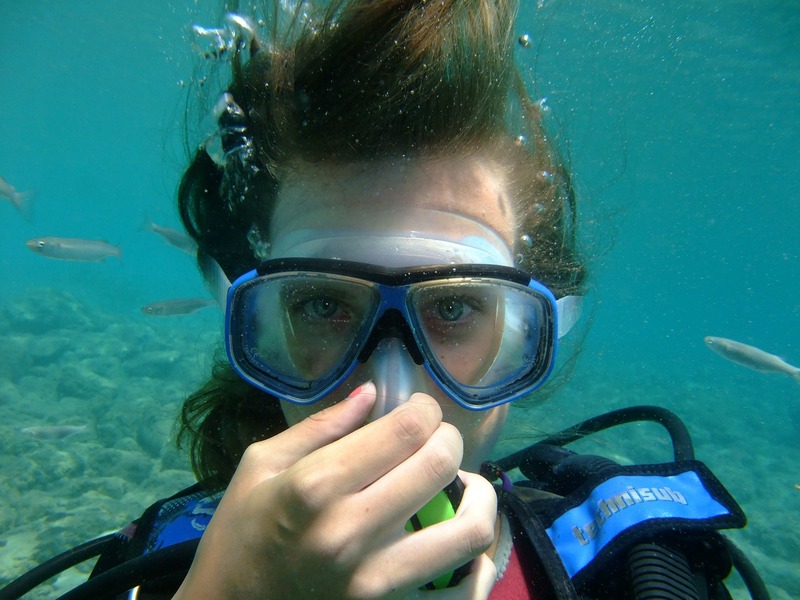 An article posted on looloo.com identifies what they call 7 common myths about scuba diving. These myths include the fear of sharks, that divers are food for sharks. Also that certification is required to scuba dive. However, one so called myth that I disagree with is (myth#3) that you dont need to know how to swim to scuba dive. It kind of makes sense that you should be able to swim if you want to scuba dive. The fact that you are constantly submerged in water doesn’t change the fact that you must have confidence and be comfortable in the water. I mean at some point you do have to re-surface and deal with rendezvousing with a dive boat. While you don’t have to be an expert swimmer, the ability to swim is a great confidence booster that can not be overlooked. … Just my opinion. To further clarify this issue, an article on padi.com highlights the fact that it is very important to be comfortable in the water before learning to dive. Hence, their requirement to complete a 200 meter un-timed swim (using any swimming stroke) and the ability to float for ten minutes( treading water or laying on your back). So while you don’t have to be an expert swimmer, you have to be comfortable in the water. You can read the full PADI articele by clicking here. 3 of their 7 myths about scuba diving are listed below. MYTH #2: You need extensive training and to be certified to scuba dive! You don’t need any experience at all. You can learn how to dive by going on an “intro dive.” This is an introductory experience to scuba diving under the direct supervision of a PADI professional. No training is required. During an intro dive, your instructor will teach you everything you’ll need to know to safely scuba dive such as proper breathing through your mouthpiece, proper positioning and use of dive mask, important hand signals, and equalizing. From the shore, your divemaster will slowly bring you into the water until you’re fully submerged. While the maximum depth for intro dives is 12 meters (39 feet), how deep you’ll go really depends on you and your comfort level once you’re underwater. Your instructor will be with you the entire time to introduce you to different schools of fish and navigate you through the most interesting sites underwater. All while making sure you’re safe. this article is mostly rubbish probably written by a non diver but definitely not written by a dive professional. However an introductory dive with a professional scuba instructor is a good way to experience scuba for the first time. I am a scuba instructor and I require intro diving participants to know how to swim, it is too dangerous for them and for me if they can’t swim. I definitely agree with you, I couldn’t imagine scuba diving without the additional peace of mind that swimming provides .. especially in vast amounts of deep water. I would think that non-swimmers would be so terrified/tense/scared to be out in open waters. Hay Tim i’m really wanting to start diving but i hear rumors that i’ll never be able to dive because i have ‘weak’ ears, when i go under water the water rushes into my ears and causes some pain, I’m not sure if anything can be done to prevent this and allow me to dive? This article should be pulled from your website. It is extremely unsafe to even remotely suggest that “You don’t need any experience at all. You can learn how to dive by going on an “intro dive.” This is an introductory experience to scuba diving under the direct supervision of a PADI professional. No training is required”. PADI would never endorse such irresponsible talk. The other myths are just as equally inaccurate . keep the integrity of your website up and please dont publish this garbage. I can understand how literally the wording does state that, but the idea ( message) was to encourage the inexperienced to start scuba lessons. Take a peek here. . .
not a diver/probably not a professionally trained diver … a traveler… and a writer. of course she’ll invite everyone to dive at any chance they have regardless of water skills level… if nothing more than bring back stories for others to attempt the same. Learn to dive on a discovery scuba…..no need to swim….REALLY!!! Whom ever wrote this is endangering new divers and their instructors! Of course you should know how to swim, your surrounded by and submerged in water for God’s sake! What a Ludacris thing to say………Very dangerous. ? Wow! “For Scuba Divers” just lost a lot of credibility with me. Are there any divers actually on staff? Yes, we get a lot of flack for this post. We are not saying you don’t have to be a swimmer, we are just highlighting the myths that folks have about diving as presented the original article from different perspectives… Everyone has their own minds and must use them for themselves. The main point of the original article was to encourage folks that may be overly intimidated by the thought of diving. You can “back fin” all you want. However the fact remains that the article should not have been published. It is irresponsible. Just please admit you’ve made a mistake and move on. Your “we just want to encourage new divers” excuse is lame and everyone sees that. If you want to regain the trust of the diving community, print a retraction.